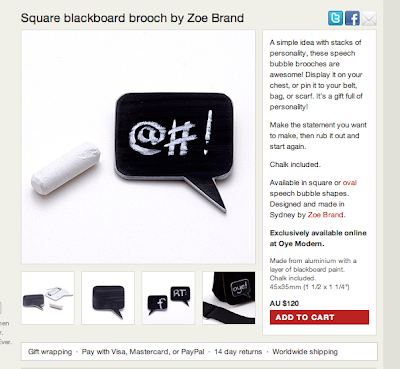 The lovely Jeni Oye from OyeModern launched my blackboard brooches about a week ago. Boy-o-BOY what a stir they have caused. They are priced at $120.00 each. Some people really REALLY don't like this. Being a maker and having your work out in the 'real world', you have to take what ever comes your way, but really, I had to laugh at the some of the comments that have been made, not just on the Oyemoden website, but also on another blog. LOVE! As a male brooch fanatic these are an easy win in my book. And as a retail salesman who moves a lot of unique jewelry, the price is super reasonable. Not everything can be purchased at Wal-Mart, folks. Special items come with a higher price tag, as they should. love em but too expensive--there are certain things where short runs prevent practical applications and this is one of them. I'd love to order them for a wedding but they are waaaaaayyy out of the budget. This pretty much leads on from the last post. Some people just don't get it. 41 artists. 205 images. 12 hour install. 654 dill holes. 25 broken drill bits. I didn't quite make it to my magic number (100). Which in some ways is a blessing, as it pretty much would have doubled the stats above. Unfortunately, it does not look as spectacular as I would have hoped. But still, you know what? not a bad effort I think. I will be putting up all the images and caption details, on the blog in the next few weeks. Last week we opened the retail store at gaffa. It is not quite finished yet, a bit more stock and a few finishing touches are still needed. Come on down and have a gander and a chat. As a birthday present to myself, I purchased some very cheap flights to Auckland, NZ. 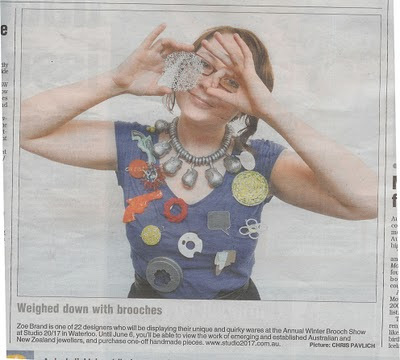 2 more sleeps and i'll be hanging out with all of Aucklands finest jewellery nerds.